Last week major real estate firms in Manhattan issued their Q1 2016 Manhattan Market Reports. 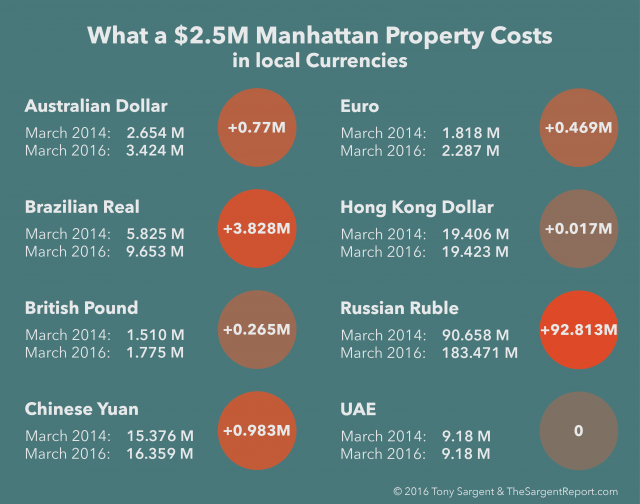 According to the reports, the average Manhattan home now costs $2 million. The reports also reveal some interesting insights into foreign buyer trends and the larger real estate market. Tony Sargent has released an e-version of his Luxury Real Estate newsletter The Sargent Report – Spring 2015. The current issue features 2015 New York market predictions and other articles: Luxury New Development Update, International Snapshot, Digital 3.0 – Tech & Real Estate, and more. As the world’s local agent, Tony Sargent provides his unique perspective and insight on Manhattan’s luxury market, as well as globally connected world-cities. A local expert, Tony has developed a private global network of top brokers with whom he shares clients and market knowledge to his clients’ benefit. Tony is tapped to speak at Industry events such as Inman Connect and RE/MAX’s European Annual Convention as well as many others and was recently invited to be a regular author/contributor to the highly acclaimed real estate industry news-site, Inman News recently. To read the full four-page issue of The Sargent Report as a PDF, click here or on the Report in the right column. For a mobile-friendly Flip-book version, click here. Fox Business Asks Jonathan Miller, Are There Too Many Luxury Apartments in Manhattan? Last month, Fox Business’ Deirdre Bolton interviewed Manhattan’s #1 go to person for clear and unfiltered real estate data, Jonathan Miller, President and CEO of Miller Samuel, Inc. a top appraisal and consulting firm. The questions on everyone’s lips today: Are developers building too many luxury homes and super-luxury condominiums in New York? Is there enough demand to meet the supply, and why have we not seen any significant new construction that serves the $3,000,000 or under market in Manhattan for years? Jonathan does a fantastic job of answering these questions in this video. For a high net worth client considering a new development I recently completed a study of same unit re-sales in some of Manhattan’s top buildings built since 2006. Which buildings saw huge equity growth and which saw little, surprised me. I will share more on that in a future post.